The Rabbit Creek Shooting Park (RCSP) complex provides hunters and recreational shooters of all skill levels with ranges for handgun, center-fire, rim-fire, archery, and non-toxic shotgun clay target shooting. Whether this is your first shooting experience or you are a professional shooter, the RCSP staff welcomes you for a safe and enjoyable time. Facility use fees vary from single day usage to individual annual passes. 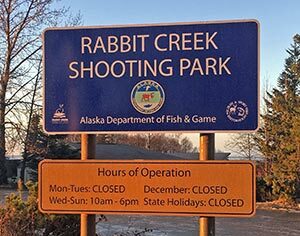 Rabbit Creek Shooting Park is open to the public Wednesday through Sunday from 10:00 am to 6:00 pm; the last customers will be accepted at the main range house at 5:15 p.m. and at the shotgun range at 4:30 pm. RCSP is CLOSED on Mondays and Tuesdays, ALL of DECEMBER, and the following holidays. The two five-stand sporting clay fields are not covered under daily usage fees. They have separate usage fees and require non-toxic shot which can be purchased at the range or you may supply your own. They are open to the public on Thursday through Sunday, 10:00 am to approximately 5:00 pm. Rifle rests, spotting scopes, chronographs, sandbags, and targets are available at the range. The friendly knowledgeable staff is always present to assist new and seasoned shooters with safe use of firearms and sight alignment. A major component of the RCSP is hunter education and training. To this end, the RCSP has a special building with two classrooms where a wide variety of classes are offered for basic safety, shooting, and hunting skills by the Alaska Department of Fish and Games Hunter Information and Training (HIT) Program. The classroom and instructor ranges (25-yard and 50-yard) can also be rented by certified firearms instructors. To find out more information about renting the facilities, contact 345-7831. Warm, safe, friendly atmosphere for everyone! A major goal of RCSP and the HIT program is to introduce Alaskan youth to the heritage of safe and fun shooting. To this end the RCSP hosts two Youth Shotgun Leagues, one in the fall and one in the spring. Girls and boys ages 10 to 15 are invited to come and experience the fun and friendly competition while developing skills shooting moving clay targets. Additionally kids 16 to 18 may shoot in a "Senior Youth League" to further hone their skills. Rabbit Creek Youth Shotgun League. The RCSP staff are assisted with running a safe range by Volunteer Range Safety Officers (VRSOs). VRSOs are people with firearm experience, specialized training, and good people skills. The primary responsibility of a VRSO is to observe customer behavior and ensure safe handling and shooting of firearms, in compliance with RCSP range rules. We have VRSOs who actively help out on various days, times, and on different ranges throughout RCSP. If you think you might be interested in receiving training and becoming a VRSO, please fill out this safety officer application form (PDF 577 kB). For a list of the RCSP range rules, see General Range Rules (PDF 19 kB). The Range Rules are also posted in the Main Range House at RCSP. For additional information, see the Contact Us and Facility Fees pages. For questions, call (907) 345-7831 or email dfg.dwc.rcsp@alaska.gov.